My husband and I thoroughly enjoyed our week at this wonderful cottage in late September. The cottage is much larger than the description would lead one to believe. The best characteristics of the cottage are first, the location. Situated in a very small village between Omaha/Utah beaches and the other D-Day beaches to the east, it is perfect for exploring the World War II history of the area. Near the cottage is the larger, but very charming, town of Port-en-Bessin, which has many amenities, such as a boulangerie, grocery stores, restaurants, gourmet food shops, a bank, and a lovely harbor. 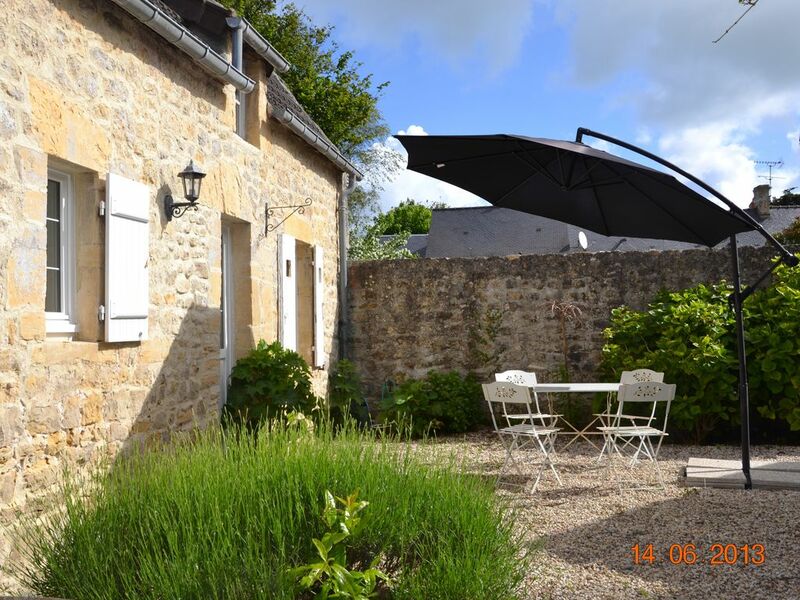 The cottage is also an easy drive to Bayeux. Second, the cottage has two wonderful outdoor spaces: an enclosed grass garden, planted with beautiful flowers and bushes and containing chaise lounges and a table and chairs. The second space is the gravel covered courtyard one can see in the photo, containing an outdoor grill and a table and chairs. Although, like many houses in rural areas, the cottage is right on a main road, which can be busy in the morning and afternoon, the windows and doors of the cottage appear to be new. The cottage is very quiet. While the furnishings are not brand new, everything is in excellent condition and very clean. The first floor bedroom is a comfortable size, with a firm double bed, a chest of drawers, an armoire, and a valet. The living room is also a comfortable size and contains a fireplace, sofa, sofa table, two chairs, and a television. The second floor consists of a large room containing two double beds and chests of drawers for clothing. The staircase to the second floor is very steep and narrow (almost like a ladder) and would not be accessible for small children or those with difficulties getting around. The kitchen is large and well-equipped. A modern washer/dryer is a terrific amenity. The cottage is a short walk to the beach and a walk around the village is very enjoyable. The only caution I would offer is that, because the cottage is directly on the main road, children should be watched carefully when outside. However, the modern gate across the driveway, which locks at night for extra security, would keep children safe inside the courtyard. The owner of the cottage with whom we corresponded by email was very pleasant, direct, and accomodating. We highly recommend a stay the cottage. Die Begrüßung war seeehhhrrr herzlich, wir haben uns rundum wohlgefühlt. Es war überraschenderweise eine Waschmaschine mit Trocknerfunktion vorhanden und das ohne Münzeinwurf, wie oftmals üblich. Eine optimal eingerichtete Küche. Einzig das deutsche Fernsehen musste ich mir selbst reinprogrammieren. Door de spontane huishoudster (Sophie)werden we ontvangen, deze legde ons alles goed uit. Kwam om de de zoveel tijd, even kijken of alles goed was. Alles was naar wens en alles was ook aanwezig. We hebben een heerlijke tijd in het huisje gehad. Het huis lag wel langs een drukke weg, maar daar hadden we weinig last van. Gute Lage zu den Landungsstränden nach West und Ost, nach Bayeux und Caen. Gut ausgestattete FeWo, freundliche Aufnahme und Unterstützung durch Sophie; trotz unmittelbarer Lage an der Hauptstraße Ruhezone im Garten gefunden. Ein-und Ausfahrt problematisch durch diese Lage.